In 2008 he gave up his career towards passion for movies and moved to settle down in India after working as a Software Quality Engineer in USA. He is awarded with Nandi Award for Best Male Comedian for acting in Inkosaari. Check out Vennela Kishore and Thagubothu Ramesh in a still from the movie Athadu Aame O Scooter. 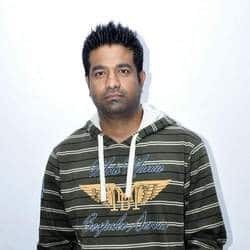 Check out Vennela Kishore in a still from the movie Athadu Aame O Scooter. Check out the poster of Athadu Aame O Scooter starring Vennela Kishore and Priyanka Chabra in the lead roles.